Frederic Remington was a late 19th century artist whose goal was to study the “Wild West.” Born into the Civil War and reconstructionist America, Remington’s age was one of “modernized” westward expansion including rail roads, telegraph, and other modernizing technology. Consequentially, the “Old West” was starting to die out and Remington wanted to preserve it with “a romantic fascination” (Remington, F. (2010)). In an attempt to chronicle the American West, Remington was assigned by newspapers and publishers to accompany cowboys, Indians and cavalrymen (Remington, F. (2010)). This resulted in extensive time spent with many different types of individuals on the frontier. The result? Beautifully sketched images of the grand “Old West” of American folklore. 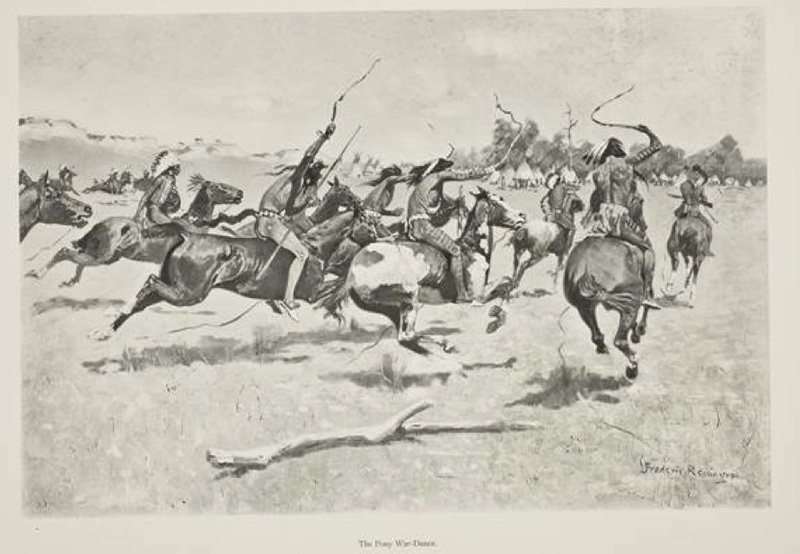 Below, is an image from an 1897 book titled Drawings by Frederic Remington. 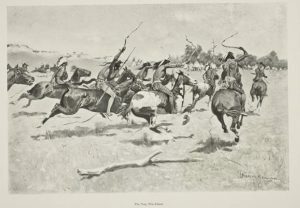 The caption below the image is “The Pony War-Dance” (Remington, F. (1897)). This sketch shows an unidentified group of Native Americans riding their horses in a choreographed dance. These war-dances were often common of the Plateau region, the Plains region, and the Eastern nomadic region of Native Americans (Bruno Nettl, et al.). Often the war dances were accompanied by instruments like “rattles incorporating deer-hooves” (Bruno Nettl, et al., Plateau region) or “strips of rawhide to which deer-hooves were attached” (Bruno Nettl, et al., Plain region) for the purpose of imitating the sound of horses. Whereas Remington’s sketch shows a unique development of this tradition that includes the actual horses in a choreographed celebration. Such an act must have taken incredibly skill and control over the horses. “wild fury of religious, that splendor of savagery crashes down to us from the Stone Age. If you will open the Old Testament where Joshua delayed the course of the sun, or they blew down a city wall with a trumpet, you will come upon the same spirit… time and the present world have no part here!” (Remington, F. (1897)). Stone Age savagery!? Are you kidding me? Horses were not introduced into the continent until 1519, at which point they had to escape from their owners and radiate up throughout the American Great Plains before the Native Americans could get to them (“Wild Horses and Native North American Wildlife”). This tribe is a group who has found, captured, tamed, and then mastered horses to the point of being able to choreograph them into a dance. It is surprising how Remington and his commenter can see this sketch as anything but advanced. Of course, Remington’s audience in 1897 was one who wanted to picture the folklore of a west that was rough and wild. For them, “tales of the American frontier [began] to assume a haziness, an unreality, which makes them seem less history than folklore.” (Remington, F. (2010)). It is understandable, considering Remington’s goal and his audience’s attitudes to American Indians possessing western land, that they would be portrayed in a uncivilized light. Nevertheless, one would think that Remington, having spent enough time with Native Americans to be able to sketch beautiful images like the Pony War-Dance, would have grown to respect the beauty and adaptability of their culture. Bruno Nettl, et al. “Amerindian music.” Grove Music Online. Oxford Music Online. Oxford University Press, accessed September 26, 2017, http://www.oxfordmusiconline.com/subscriber/article/grove/music/45405. Remington, F. (1897). Drawings. R. H. Russell, New York. Such lively writing, and a really fascinating topic – thank you! I’m a little confused about which archival collection you mined to find the Remington, since your citation made it seem like you found an ebook of Remington’s art rather than finding it through one of the assigned databases. When you get a chance, could you let me know which one you used? I really liked how you brought together such disparate sources – not just the Remington images but Nettl’s Grove article and the book on horse history – and the cherry on the icing on the cake would have been drawing in Dan Blim’s essay. You could have connected the “Indianism” of MacDowell and the writers that Blim cites with Remington’s own effort to “preserve” the “noble savagery” of 19th-century Plains Indians. Don’t forget to tag your post, and keep writing great posts like this one!